The total biomass, including all organic and animal raw materials and the products produced, like groceries, cosmetics or pharmaceuticals exhibit a natural designation, the so-called Isotope-Fingerprint. Due to their metabolism, plants and animals take in water from their environment. Therefore the water retained in their tissue reflect the isotope ratio found in the region from which they come. This natural location specific fingerprint is invisible. It cannot be changed by chemical additives or processing. 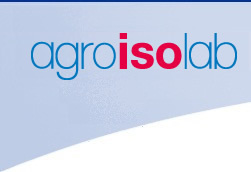 The scientists at Agroisolab GmbH developed the worldwide patented designation system ISO-ID. The product specific label is created water based and enables a rapid and certain analytical identification of the product. Agroisolab GmbH is working continuously on the development of further designation systems. e.g. based on other bioelements. Do you have questions regarding the labeling of your products? The marker can be dosed in such a way that it can be detected only in the animal feed or also in the egg as well. It is thereby possible to test the origin of the animal feed from this animal feed mill. In addition, it can be tested by analyzing the eggs that the farmer used only this particular animal feed indeed. In case only animal feed from this mill is used by e.g. a production consortium, the origin of the eggs from this production consortium can be verified.